Learn about the temperament and personality of the Norwegian Elkhound. Discover what he's like to live with, his traits and characteristics and how he generally behaves. And look at lots of Norwegian Elkhound photos. The Norwegian Elkhound is a courageous and loyal companion who loves to be part of the family. (And he's not a hound!) These are bold and friendly people-dogs, the extroverts of the canine world. They are loving, good-natured and remarkably intelligent, yet they do have a stubborn streak. They are independent thinkers, and while trainable, they are not a blindly obedient dog. They are energetic dogs and will need regular daily exercise. They like long walks and are a little too dignified for fetch or roughhousing. A bored Elkhound will get into mischief. A stimulated Elkhound will be docile, dependable and trustworthy. But it will be up to you, the owner, to ensure that the Elkhound knows who the pack leader is. While the Elkhound is not aggressive, he is protective and sometimes possessive of his family and property. He is a commendable watchdog. He is highly alert and will bark at any strange noises. He does enjoy barking. The Elkhound does well with children, especially when introduced to them at a young age. He was bred to be an all-purpose working dog and he has spent many generations on the family farm, so he can be trusted around farm animals. However, he does best with a fenced area to play because he will follow interesting smells and end up miles away from home. The Norwegian Elkhound is an ideal pet if you are looking for a versatile, devoted companion. Just know that they need to be around humans to be happy. This is only one of the reasons they make excellent therapy dogs. 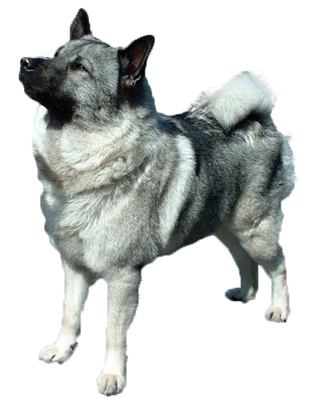 The Norwegian Elkhound is intelligent and quite easy to train. He learns new commands quickly at an above average rate. The Norwegian Elkhound is a very heavy shedder. He sheds an awful lot of hair! You'll find hair all over your home, stuck to everything! You'll probably even find it in the butter!